It really does shock and amaze me how many developers get through the day without knowing the wonders of the Exceptions Dialog box. You can access it via Debug>Exceptions or you can hit Ctrl-Alt-E. What this dialog box allows you do is to pick a set of exceptions (or all of them for that matter) and the debugger will automatically break when the exception is thrown. This allows you to inspect your call stack and interrogate your variables to determine the state of your application when the exception occurred. No longer do you have to look through an error message to find a line number and start setting break points. This becomes especially helpful if the error is occurring in a gigantic loop and your not sure how many times the loop executes before it runs into a null reference exception. It breaks automatically and voila, you can easily see all the variables that are associated with your null object (or whatever the error may be). Sometimes you'll be responsible for code, that for one reason or another uses exception catching/handling as a normal part of code flow. This usually is considered a bad practice but sometimes you don't have a choice under the circumstances. 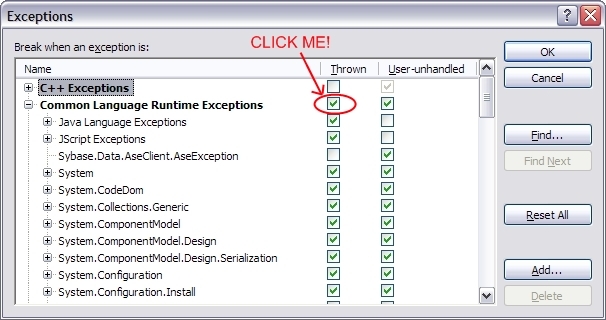 When that happens, it is very easy to turn off custom typed exceptions, just click the "Add..." button and type in the fully qualified name of the exception you don't want to see every time it is thrown. As you can see in my screenshot, I've done this with the Sybase.Data.AseClient.AseException exception. I hope this helps speed up any future debugging.